HI! 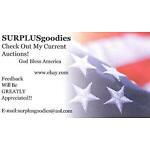 Welcome to my eBay Store! Feel free to check back, as I am always adding NEW & EXCITING items each week. FEEDBACK is ALWAYS left for you and hope you do the same for me! If you wish to purchase multiple items, I combine them to save you on shipping!